Palm Beach Prints has a large collection for furnishing fabrics based on block prints, We also offer a selection of limited edition block prints on high quality archival paper stock. The fabrics and prints are not widely available commercially, however currently a limited selection can be ordered directly from this site. View the image samples, on displayed in the Fabric and Print Galleries where you can also place an order. 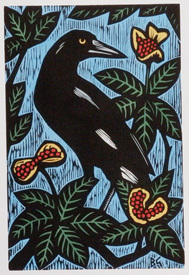 Linocuts, woodcuts, silkscreen fabrics, paintings and collage comprise the major part of Bruce Goold's artwork. His is a bold, narrative-laden art where a wide range of information catapults out of the shadows to illuminate the printed surface, the story, the event, or often a combination of all three. Goold says: 'a successful block print can hang in the street and not look amiss. Since the inception of the alphabet for block-printed publications and the subsequent hand-engraved illustrations that accompanied them, text and image have a matching strength. As a visual vocabulary the block-printed illustration can be understood in the same way as the written word: proclamations, posters of all sorts – ‘Wanted’, circus, travel. Hand-printed images designed to strike attention appeal to me. Dating from early Chinese block prints and Coptic textiles to graphic French posters, the block print has a timeless authenticity'.